Last week, I made this beautiful little bird in my crock pot. It was great. Moist, seasoned, and demolished. Just the way I like it. This my dear friends, is crock pot chicken – or if you want to be politically correct – slow cooker chicken. All too often, I am looking for ways to create culinary delights in my crock pot because as of late, I’m not really desiring the entire being handcuffed to the stove type dinners. With this dinner I was able to cook an entire chicken with a side of vegetables, and some potatoes and get on with the rest of my life which included lots of laughing, tickling, and random squealing. There is no hard and fast rule to cooking an entire chicken in your crock. Use the spices and seasonings that you like. If you want it citrusy, then stick a lemon into the cavity of the bird. If you want savory, use garlic, thyme, rosemary, paprika, etc. This is a way for you to cook it up YOUR style. I will say, I used the “keep warm” method to cook this all day, instead of the low because I didn’t know if I would have to leave out at all during the day. My crock cooks on a very high “low” setting. It’s weird. Try it and tell me if you like it! 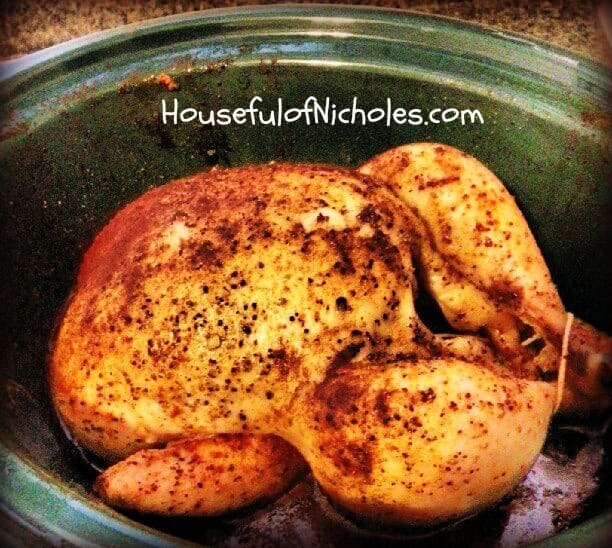 I would love to add a crock pot chicken to our dinner menu this week! What liquid did you use? No liquid. The chicken produces its own. You can layer vegetables underneath to have it not sitting directly in the juice that will come from it. I did rub it with olive oil though. You can also put small pats of butter underneath the skin to get it crispy as well. Hey i LOVE the Picture…It got me here!!! This looks delicious and healthy to boot! !